Californina Fight Syndicate MMA Event Santa Monica January 28 | MMA Fighting Events Videos Techniques UFC Fight Picks and News. Los Angeles area MMA (Mixed Martial Arts) fans are in luck. This Saturday, January 28th, Los Angeles MMA fans get a chance to catch some live MMA action in Santa Monica. California Fight Syndicate (CFS) is bringing pro MMA fights to the Civic Auditorium. Tickets for this MMA event at the Santa Monica Civic Auditorium start at $35.00. Doors open at 5pm and fights start at 6pm. For Tickets and more info go to www.CFSmma.com. The Santa Monica Civic Auditorium is located at 1855 Main Street, Santa Monica California 90401 . Check out the Californina Fight Syndicate promo video for this MMA event. 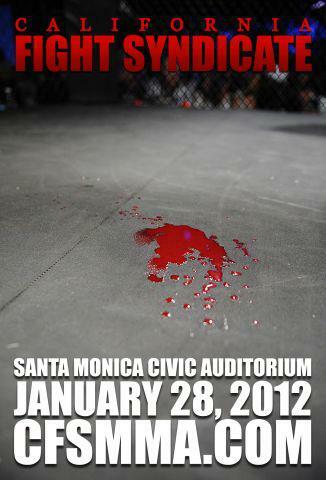 Here's the CFS MMA fight card for the Santa Monica Civic Auditorium January 28th. If you're going to miss this MMA event, stay tuned and stay updated on other MMA events in Los Angeles, and the Los Angeles area.